This site is dedicated to the memory of John Freed, Sr., who died in January of 1997 after a brief bout with cancer, and to the memory of Sally Freed who passed away in December 2005. Grandpa is sadly missed by his family, but we'll all always remember his great sense of humor and his love of fishing. Grandma will be remembered for her artistic and crafty abilities. Most of all we'll remember the love both shared for their family. 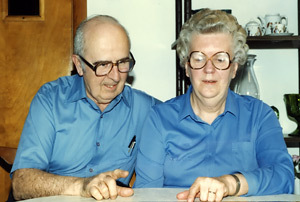 John and Sally were both school teachers in the Mount Pleasant, PA, district. They spent most of their lives in the same home in Mount Pleasant, and then moved briefly to Punxsutawney, PA, to be closer to family. They moved back to Mount Pleasant until the time of John's death.